Dead Tree Down – Who Dried My Jeans?! On August 17, 2015 August 18, 2015 By Who Dried My Jeans?! It was mid morning Friday when I heard the doorbell ring. While I usually don’t allow Haley, my 3-year-old, to unlock and answer my front door unsupervised, it was a ring that sounded like my 7-year-old son’s neighborhood partner in crime, who rings the doorbell at approximately 1 time per second for at least 7 seconds…so I let her. Much to my surprise I heard a man’s voice asking to speak to her mother. I promptly left my unloading the dishwasher task to investigate the man’s apparently urgent need accompanying the dramatic ring. Somewhere during our short conversation I was confident that I wasn’t looking into the eyes of a professionally trained and licensed arborist. I was so sure about this, I didn’t even waste my time to go out and look at the side of his truck to see if it said something like “Odd Jobs by Ronnie” and then below that in bold print see his number: 1-800-FNGRS-XD. 3. He wanted to get a look at the nearing middle-aged woman dressed in $9 Walmart sleepwear that his uncle Ronnie had told him about. While I do tend to wear my clothing on the looser side so I will feel thin, I totally needed a medium in this nightgown instead of the large I was wearing. I thought I was safe taking a $9.00 risk after holding it up to me for size instead of putting me, 3 kids, and a shopping cart in a dressing room with us. (There was no way I was going to leave that full cart unattended and take the risk that some overachieving Walmart employee was going to take it up front to be restocked. NO WAY! I worked hard for that and I wasn’t about to re shop a second time all while trying to read through a scratched out list. NO WAY!) But boy was I wrong. This nightgown hung up on me in a way that made me feel so thin I almost experienced guilt, imagining my loved ones and closest friends being concerned about my thinness. Haley and I perched by the kitchen window to watch the tree falling take place. I easily spotted the only other woman on site among at least five other chainsaw operators, with at least three of them being underage thrill seekers. She was wearing the brightest colored Chartreuse t-shirt undoubtedly made; I’m sure for the only reason, was that while they are wildly popular now, she couldn’t find a full jumpsuit in that neon color to keep her limbs from blending in with those of the trees. 3. How she hadn’t seen him do anything hotter than when she witnessed his last Friday’s odd-job requiring small explosives. The truth is I hadn’t experienced so much nervous excitement since watching a 4th of July fireworks display at my parents farm in even more rural West Virginia. I was unsure if my dad, who is still adjusting to retirement, was the ring leader of the event or if it was my brother-in-law, who I’m sure smuggled them across the state line after being asked by my father, (who I’m sure paid for them) to do so. Or maybe… they were cohorts, because they both denied to my mother “when” and “how” they got them and both reassured her that everything would be fine. From previous years experience, all bystander of the 4th of July me-hem were safely positioned about 100 ft away so we wouldn’t be forced to suddenly jump up and grab our folding chairs and run. We all did conclude that we would miss hearing my mother yell “Oh, Jule-yun” as she grabbed her own chair and began running. (Jule-yun is West Virginian for Julian by the way.) There was a Center City Chicago lawyer on site, who seemed to be excited about helping them out, but I was confident he was unaware of how quickly redneckedness can get out of hand and I was concerned for his safety. (Only a wee bit less than the possibility that he wouldn’t bring my childhood friend and her son into visit me anymore if things went badly.) I was also concerned about my dad who had broken his toe at our family beach trip the week before. There would be no way that he would be able to out-limp an extra-spectacular firework, like happens on occasion, all while dodging cow pies. The display turned out to be so fabulous that all six children present (and positioned at a safe distance away) began chanting “Disney World, Disney World!! !” over and over again and pumping their fists. At this moment I made a mental note to transfer all monies saved for upcoming Disney trip into my account titled: Susan’s House Remodeling Fund. I was sure that even Walt himself couldn’t top this memory of a lifetime. Well, the only one I wasn’t worried about in this trees falling event was Ronnie’s wife in Chartreuse. Everyone else dressed in Camo was at risk in my book though. There was a pause of the symphony of chainsaws. It was time for the tree to fall or would it be “the falling” to take place? 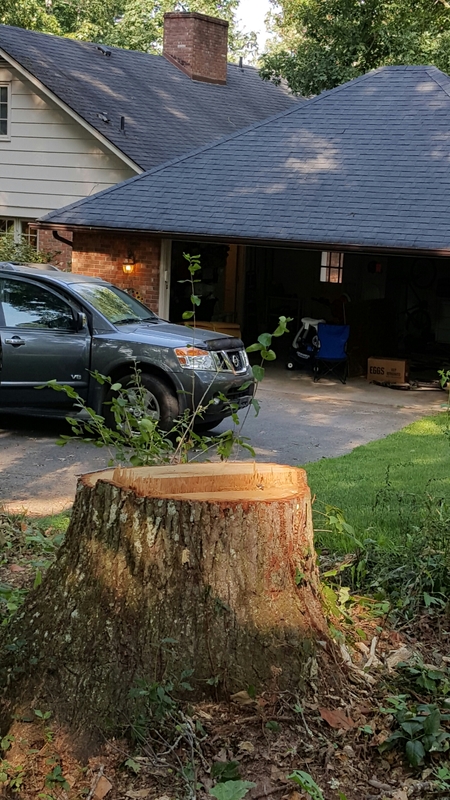 I figured I could simply say “to be cut down” to avoid confusion, however, I knew we’d have another word choice dilemma once the tree was laying in my driveway… so I let it go and simply looked forward to talking about the tree that was just “felled”? 4 All of the above. I sat down and wiped my brow in relief that only 2 huge shards of dead tree flew into my garage and hit our refrigerator and a 35 year-old hand me down John Deere that was also in perfect working condition. There was only one question left: If this tree had fallen in the woods with none of us around to hear it, would it have made a sound? At this moment I got out my phone and created a new contact titled “Odd-Jobs by Ronnie”. Ya see, I’m looking for a good plumber and if he can fall a tree with this kind of accuracy he’s the man for me. NOTE: All of this is mostly true with only occasional input from my imagination. (Except for the squirrel and damaging shards flying into my garage. Those were lies. Both lies.) In addition, I have no clue what’s Ronnie’s real name is but I’m sure my neighbor wouldn’t have hired him if he weren’t legit because he was our insurance agent. I say “was” not because he was tired of investigating possibly frivolous claims, but because he’s retired. Susan, some day you will seriously entertain the thought of quitting your day job and spending your time in a more lucrative activity……………you already have a good start for book #1. Who could enjoy your inner thoughts more readily than your neighbor.. I derive much pleasure from you and all of your ” hoodlums”. xoxoxo Betsey. Love you Betsey and of course Bill!